ColorNote - We simplify your life! ColorNote makes your life easy, simple and stress-free. Live your life with ColorNote! Effortlessly stay organized with colors! Colors make it easy and intuitive to organize information. Once you see colors, you will instantly know how to use them to manage your life. Don't worry if you are not good at organization. Anyone can easily and effortlessly use ColorNote. 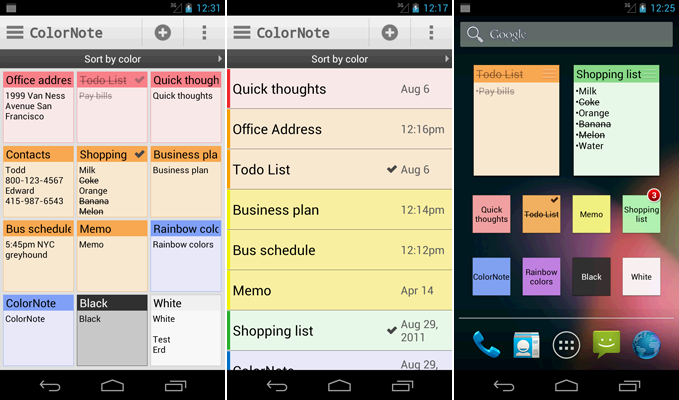 ColorNote actively reminds you of saved notes so you'll never miss anything important. Concentrate on what really matters in your life without the worry of forgetting. Your notes are backed up to sd card or cloud storage. Once you keep your stuff in ColorNote, they will always follow you even if you switch to another device. Never worry about losing your stuff.